At St. Mary’s School, an International Baccalaureate World School in Aliso Viejo, California, teachers are always looking for ways to broaden students’ global understanding. To that end, Heidi Galloway, Chair of the Literature and Language Department, recently offered Global Conversations to all four of her sections of sixth grade English. Her students read and discussed I am Malala with global partners in India and Uganda. “It has been a fantastic experience. The partnership has elevated my students’ thinking and awareness. Their global partners are becoming real to them, real people, real friends,” said Galloway. Picture this: Rafay is teaching Kayaunna a few words and phrases in Urdu, his native language. Andrew is excited to hear that his partner Hakia also uses a PlayStation 2 video game console and shares his passion for video games and sports. Zoe, who is a voracious reader, is delighted to learn that Eksa’s favorite book is Narnia. 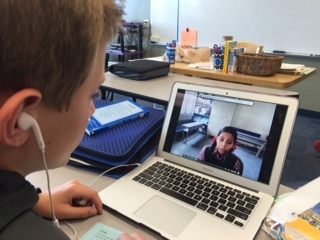 Although they have never met in person, a group of ten students at All Saints Academy are now 21st century video pen pals, so to speak, with students at iEARN Pakistan. They are collaborating together in Level Up Village’s Global Web Designers course offered as part of our after school program this spring. For eight weeks, we are crossing geographic, cultural, and language barriers to work on solutions to a common environmental problem and learning web design skills at the same time. We have been busy developing new curriculum here at Level Up Village and are proud to announce some exciting additions to our roster of global education courses. Designed to develop 21st Century skills, our courses all include collaboration and cultural exchange with Global Partner students in developing countries. What a great way to get students energized about what they’re learning and develop a global mindset! My favorite teachers were always the ones that believed more in me than I believed in myself. With a twinkle in their eye they would let me try, fail and then gently encourage me to try again. Even though I would become extremely frustrated with myself, I can still distinctly feel the patient presence of my favorite teachers urging me to forge ahead. We’re delighted to announce that Lynn Koresh, technology teacher and coordinator at Edgewood Campus School in Madison, Wisconsin, is our very first Level Up Village Teacher of the Year! We’re recognizing Lynn for the terrific work she has done with her students in her LUV courses including Global Inventors and Global Video Game Designers.